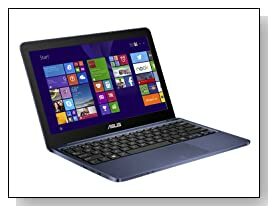 Dark blue ASUS X205TA-DH01 EEEBook is a super slim and light budget 11.6 inch laptop with a full size keyboard, a fast quad core Intel Atom processor and very long 12 hour battery life as a new decent competitor of Chromebooks, it appears to be designed primarily for internet use and basic daily things. What you're getting here is like an improved and evolved version of netbooks or Chromebook without Chrome OS but Windows with similar features. ASUS X205TA comes with the Intel Atom Z3735 Bay Trail processor that is also used on some low-cost tablets.at 1.33Ghz speed up to 1.83GHz with turbo function, 2 GB DDR3 SDRAM for some multitasking power, 32GB flash memory for very fast boot-ups and almost instant on resume from hibernation, 2 years of 500GB of cloud based Asus Webstorage and 64GB expandable through microSD and Windows 8.1 operating system with Bing software. 11.6 inch LED-backlit HD non-touch glossy high contrast 1366x768 pixel maximum screen resolution offers sharp graphics when looked straight-on, and although viewing angles are not great- definitely not like an IPS display, seems to be better than viewing angles on Chromebooks. Intel HD Graphics (Bay Trail) allows you to play older and not so demanding games like World of Warcraft and in very low settings and any of the newer game titles would be quite hard to play. Sound is all right with the 2x2W high-quality stereo speakers and it has a good quality microphone built into its front facing VGA webcam. 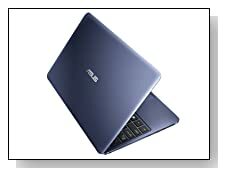 Dark blue ASUS X205TA-DH01 with smooth curves and matte plastic finish weighs only 2.2 pounds with measurements of 7.60 x 11.30 x 0.70 inches so it will easily fit in any size bag. It is highly portable and this is partly helped by a long 12 hour battery life from its 38Whr lithium ion battery and can be left on standby for up to 14 days but it is not user replaceable. It has a full-size chiclet style comfortable keyboard with spaced out keys and an ample trackpad to use with Windows 8.1 tiles and functions. You will find the dual band 802.11 a/b/g/n Wi-Fi for faster web browsing, 2 x USB 2.0 ports, a 3.5mm headphone jack, a micro-HDMI port, and a microSD card slot (SDXC, up to 64GB). Conclusion: While netbooks are no longer in fashion slim, light- portable and low cost Windows and Chrome notebooks are currently ruling the notebook sales. The new Asus X205TA is like a revamped version of 2007 model Eee PC seven years later. You will find the Bing search engine when you first turn it on- which is almost like a message that implies that Google can stay on Chromebooks. It is ideal for things like word processing and net surfing - performing basic daily tasks and you can't expect anything super powerful here, but certainly better than years before and what you can possibly get at this price. It works quietly thanks to its fanless design, very large touchpad is nice to have as well as SSD rather than regular HDD- for snappy performance and you have the 500GB free web storage anyway. A good value computer at this very low price level.